by Robert Uzzell and Chip Mitchell: Floyd Mayweather, Jr is in the final three fights of his career. Many names have been thrown out there: Manny Pacquiao, Miguel Cotto, Saul “Canelo” Alvarez, Keith Thurman, Danny Garcia, Shawn Porter, and of course Marcos Maidana. 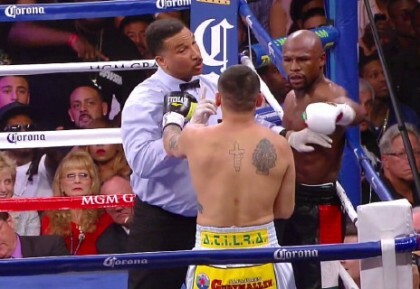 In Floyd’s last fight, he faced his stiffest challenge in a while in defeating Maidana by majority decision. The victory by Floyd came at the cost of a few shots to the family jewels and a nice shiner above his right eye. Before we get to the predictions, let’s look at the odds of each fighter facing Floyd in September. Manny Pacquiao – 0%. The politics or politricks involved continue and even if both guys were ready to play, there is not enough time to build up this super-fight. Miguel Cotto – 5%. Cotto just fought on June 7 and even though Sergio Martinez proved to be no more than good sparring for Junito, Cotto needs more time off. Miguel is on a high right now with The Bug in his corner, and many are calling for a rematch with Mayweather. However, a lucrative bout with fellow Hispanic star Alvarez looms large for the new tandem of Oscar and Arum. Of course, Erislandy Lara may have something to say about that. Nevertheless, Cotto would be wise to wait for the outcome of Alvarez/Lara in July before weighing his options. Saul Canelo Alvarez – 0%. Unless Team Mayweather does to Lara what Team Canelo did to Ishe Smith, this one ain’t happening. Remember Canelo came up with a sweeter deal for Lara, meaning much more money. Ishe Smith knew what time it was and had no hard feelings. It’s doubtful we would see the same thing happen here. Alvarez has a July bout which rules him out. Besides, he would have to beat Lara and Cotto to get another shot at Floyd. Keith Thurman – 0%. A couple more big knockouts by “One Time” and we could see him in the sweepstakes come 2015. He needs to continue to build his brand and win in a step-up fight, preferably on a couple of Mayweather undercards. thought Diaz won. Porter won a split decision. That combined with marketability, or lack thereof, drops Porter out of the September 13 sweepstakes. Besides, Porter has some business coming up in August or September with Kell Brook. Danny Garcia – 0%. Danny was originally a dark horse candidate for Mayweather on September 13. He was coming off of a close win against Mauricio Herrera, but still needs a fight at 147 to justify a match with Mayweather. A press release just came out stating Garcia will headline a card in Brooklyn on August 9. That puts Danny out of the September sweepstakes. Amir Khan – 1%. This would be a good matchup. Unfortunately Khan, for religious reasons, cannot fight on September 13. Ramadan runs from June 28 to July 28. Khan needs a training camp longer than around 5 weeks to prepare for Mayweather. I’m sure team Mayweather could put plenty of money on the table to induce Khan into fighting on a shortened camp. If Khan bites and loses, we know what his excuse would be. He’ll say he wasn’t at 100% strength. This scenario is doubtful. Khan is 99% out of the September sweepstakes. Marcos Maidana – 50%. Marcos is the best pick right now for a fight. The obvious pick based on the entertaining scrap he had with Floyd in May. So why is he only a 50% shot? Well let’s take a look at the predictions and find out. Robert Uzzell: On September 13, I think Floyd will fight nobody. Richard Schaefer just left Golden Boy. Let’s say he does team up with Al Haymon. They need time to form a union and get the planning and analysis stage complete. This will take some time. While Schaefer knows how to put an event together, understand that he already had pieces in place while at Golden Boy Promotions. Promoting fights of a Mayweather-level take a lot of work. Ain’t as easy as it looks fans. If the fight is pushed back, it will allow Mayweather Promotions to function as a full-fledged operation. Just as a fighter needs time to develop (unless your name is Lomachenko), so does a promotion that will be home to multiple fighters. On top of that, a few sources tell me that Mayweather’s cut is not healing as fast as he’d like. Who could believe we’d get this scenario so close to the end of his career? I could. One reason is Floyd is not used to being cut. Secondly, his cut is in a bad spot, a tender spot on the face. We’ve seen our heroes in the past get through fight after fight unscathed. But as they hit their mid-thirties, we see them become human right in front of our eyes. Whitaker’s eye against De La Hoya. His clavicle against Bojorquez. Roy Jones busted up badly versus Calzaghe. These are defensive guys who began to decline and started receiving more hits and consequently more injuries with age. Floyd will be 38 in about 6 months. Clock is ticking. As much as he probably wants to fight, my prediction is that he fights a few months after September. The month will be October, November, or December. The opponent will be Amir Khan in front of 80,000+ fans in Wembley Stadium. If you’ve booked a room for September 13th in Vegas, my prediction is that you will see an empty arena on that date. Get a refund. See you in the UK. Miguel Cotto? Well Cotto just fought. So he’s out. Danny Garcia? He’s scheduled to fight August 9. So he’s out. Keith Thurman? Not enough following at this point. Shawn Porter? No! Amir Khan? Ramadan. He’s out. Canelo Alvarez? He fights in July. He’s out. Ahh, I got it. Manny Pacquiao??? Ain’t gonna happen! So that leaves one guy who can get Mayweather better than 1 million buys. Marcos Maidana. If Floyd got close to 1 million buys in his last fight with Maidana, he should do better this time. Why? Well, because the fight was so entertaining. It had drama that fight fans have been seeking for years. Maidana fought hard. He fought dirty. He didn’t try to get fancy like past opponents. He came to fight and he came to win. The drama carried all the way up to the reading of the scores. So Maidana is the logical choice here. BUT WAIT! Where’s the press tour for the rematch? A press tour usually takes place about 2 months before the fight. Prior to that, there is the announcement of the fight. We’ve had no announcement. We have no venue. No press tour to speak of either. No nothing! That speaks volumes. If we move forward with a fight on September 13, 2014, the opponent has to be Marcos Maidana. Anyone else would be cutting this thing too close. My guess is that we go with Maidana and the rematch. Add a Keith Thurman and a Broner to the undercard. If he doesn’t choose Maidana then I believe the date gets moved to late 2014, possibly November or December. I’m hearing some rumblings about Floyd’s cut healing slowly. The clock is ticking. It’s either Maidana at this point or the date is going to be pushed back. I can’t imagine another opponent that will give him the numbers he needs for a September fight. It’s too late. However if there is one, his team better announce something soon. We are less than 75 days out.